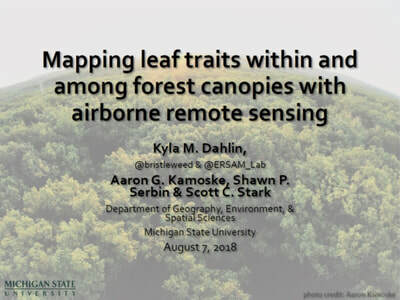 Currently this work is funded by a NSF Macrosystems Early Career award to Kyla - MSB-ECA: Ecosystems in four dimensions: Measuring changes to forest structure and function in the Anthropocene - with Scott Stark (MSU) and Shawn Serbin (BNL) and ERSAM Lab grad student Aaron Kamoske. The following are quick introductions to the topics and the work we are doing - recent presentations and posters are at the bottom of the page. Spectroscopy is the study of how light ('electromagnetic radiation', really) interacts with stuff. In the case of Earth materials (plants, rocks, soil, water, etc), light bounces off of different materials in different ways, letting us understand more about what is where on the Earth surface. Perhaps most importantly, 'light' includes wavelengths outside of the narrow human-visible part of the spectrum*. How light in the UV, the infrared, and the thermal interacts with different materials can show us all sorts of cool things that aren't visible to the human eye. 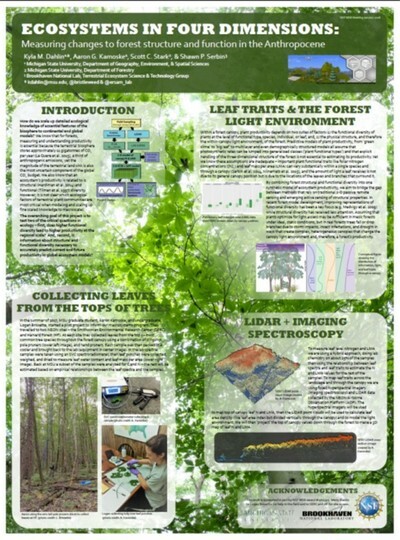 Hand held spectrometers, like the one shown here collecting spectra on a Magnolia macrophylla leaf, can be used to collect spectral signatures of different materials that can then be linked to those materials chemical constituents, water content, physical structure, species identity, and more. Imaging spectrometers (aka hyperspectral imagers) can actually take pictures where each pixel has a spectral signature like the ones you see here (albeit somewhat more noisy). This means we can use imaging spectrometers to make maps of things like leaf chemical properties, geology (if there's no vegetation in the way), and lots of other stuff. * = total aside -> did you know that bees can see UV light? Some birds and other animals can as well. It's super cool. 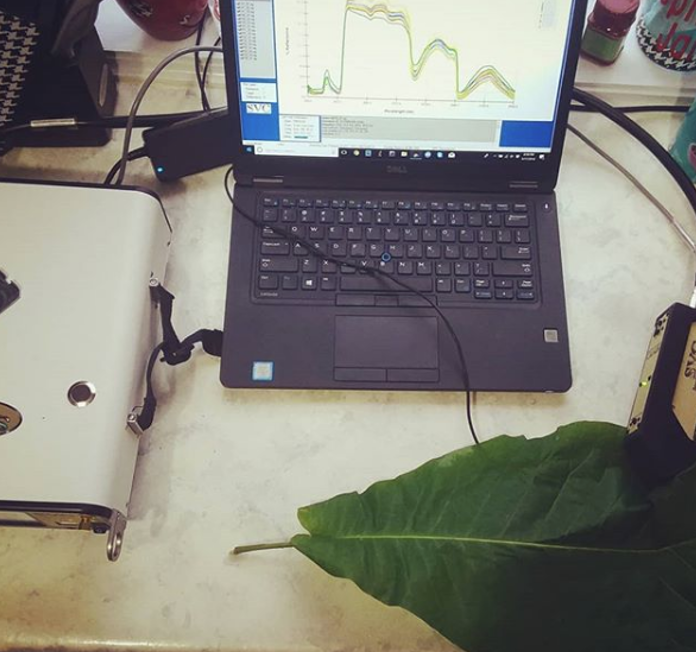 Our SpectraVista spectroradiometer with leaf clip collecting spectra from a Magnolia macrophylla leaf from Talladega National Forest (Alabama) in 2018. Photo credit: Aaron Kamoske. LiDAR (light detection and ranging) is an active remote sensing technique where a pulsed laser (!) at a specific wavelength bounces off of objects and the returned light gives us a measure of the physical structure of the objects the laser encounters. LiDAR systems attached to airplanes allow us to measure the physical structure of landscapes - the trees, rocks, topography, etc. These measurements are most frequently used to create high resolution digital elevation models (with or without vegetation) and to measure the heights of trees and other objects. In our case we are interested in what we can learn from the within canopy LiDAR returns, or the 'point cloud', because this can tell us about the light environment that each leaf or group of leaves encounters. 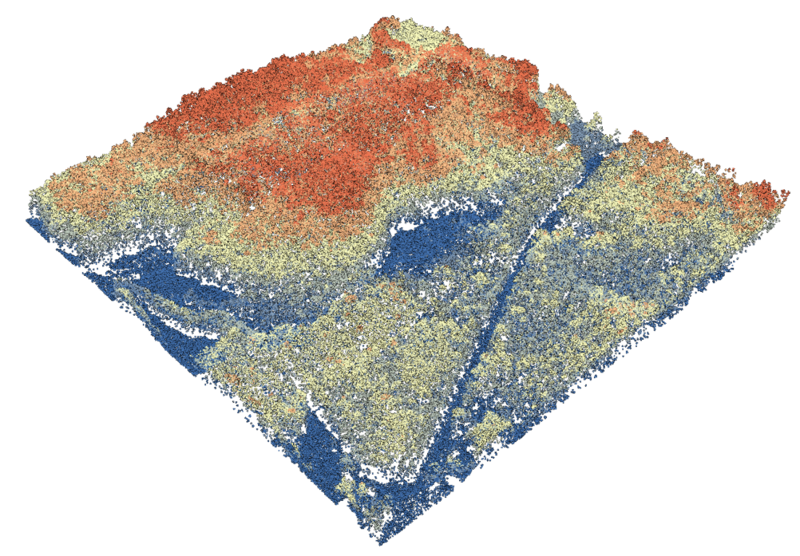 Currently we are working on developing a point cloud to leaf area density (LAD) model so that we can turn the LiDAR data into a voxelized (cubed) model of leaf area in each cube of forest across a landscape. A LiDAR point cloud tile from the Smithsonian Environmental Research Center, collected by the National Ecological Observatory Network's Airborne Observation Platform. 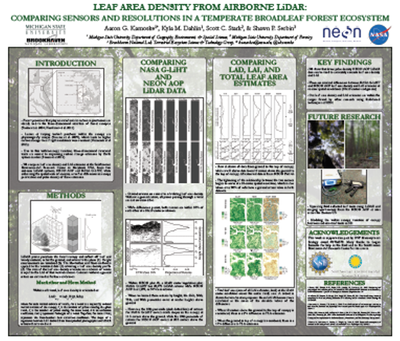 Connecting the hyperspectral imagery to the LiDAR data will allow us to 'project' the top of canopy measurements of leaf traits down through the canopy, allowing us to build a three dimensional model of the forest stand or ecosystem. We're working on this now, so stay tuned! 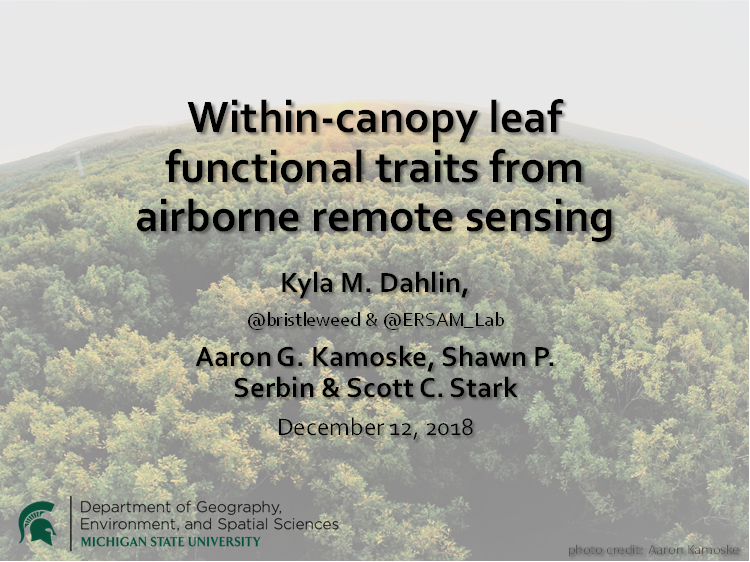 Or click on Kyla's 2018 ESA presentation (below) to see some preliminary data. 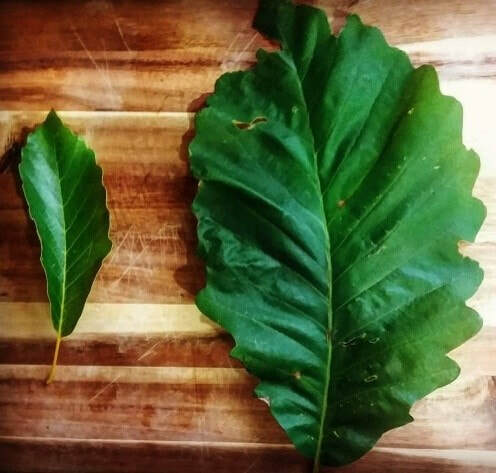 Two Quercus montana leaves from the same tree - leaf on the left was collected from the top of the canopy, leaf on the right from the bottom of the canopy. Both were collected in 2018 from Talladega National Forest, Alabama. Photo credit: Aaron Kamoske. Dahlin KM, Asner GP & CB Field (2013) Environmental and community controls on plant canopy chemistry in a Mediterranean-type ecosystem. Proceedings of the National Academy of Sciences USA. 110(17): 6895-6900. Dahlin KM, Asner GP & CB Field (2012) Environmental filtering and land-use history drive patterns in biomass accumulation in a mediterranean-type landscape. Ecological Applications. 22:104–118. Mascaro J, Asner GP, Muller-Landau HC, van Breugel M, Hall J, & KM Dahlin (2011) Controls over aboveground forest carbon density on Barro Colorado Island, Panama. Biogeosciences. 8:1615-1629.